SPX has continued to trade within the confines of its latest near-term trading range, frustrating anyone who's been hoping for even a short-term trend. We were somewhat spoiled by the volatility from October until early January, and the last couple weeks have been decidedly less interesting -- and certainly more ambiguous. As such, there really isn't much to add. 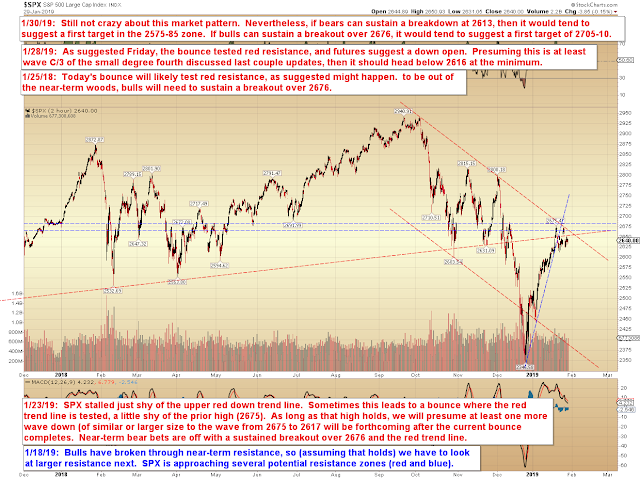 I've presented a couple "if/then" equation targets on the chart below, but given this market's propensity for b-waves (patterns that reverse before completing their usual expectations, only to whipsaw and reverse again to then FINALLY complete their usual expectations), I would even be cautious with those. In conclusion, there's no real change and not much to add. Hopefully the market will get interesting again before too long. Trade safe.